The Marine Corps had an active year in 2017. Among their many accomplishments, Marine units were responsible for massive artillery barrages that helped defeat ISIS in its former capital city of Raqqa, testing a fully autonomous helicopter, and graduating their first female infantry officer. Aside from that, Marines participated in a number of air and ground exercises around the world. We took a few of the best shots from this year to show you what kind of a year it has been for the Few and the Proud. A Crew Chief assigned to Marine Light Attack Helicopter Squadron 167 observes the landing zone from a UH-1Y Huey during a training operation at Marine Corps Auxiliary Landing Field Bogue, North Carolina on March 9. Marines working with III MEF Marines fly the AH-1Z Viper and UH-1Y Venom past Mount Fuji in Japan on March 22. A Marine with the 11th Marine Expeditionary Unit fires an M777 Howitzer during a fire mission in northern Syria as part of Combined Joint Task Force — Operation Inherent Resolve on March 24. Photo Credit: US Marine Corps. Machine gunners assigned to Special Purpose Marine Air Ground Task Force-Crisis Response-Africa move toward an objective area during a Military Operation on Urbanized Terrain exercise in Alicante, Spain on March 29. An F-35B Lighting II aircraft prepares to land during a training exercise with Airborne Tactical Advantage Company at Marine Corps Air Station Beaufort on April 14. An AV-8B Harrier II, F/A-18 Hornet, and a F-35B Lighting II fly over the 2017 Air Show at Marine Corps Air Station Beaufort, South Carolina on April 30. Marines fire an M777-A2 Howitzer in northern Syria on May 15. Marine Fighter Attack Squadron 232 conducts flight operations during exercise Distant Frontier on Joint Base Elmendorf-Richardson, Alaska on May 17. A color guard detail with Marine Forces Europe and Africa presents colors during a French Memorial Day ceremony at Oise-Aisne American Cemetery in France on May 28. The Marine Corps Silent Drill Platoon performs for a crowd at the 9/11 Memorial Plaza in New York following the 2017 Freedom Run, May 28. A Marine waits to conduct a fire mission in the early morning in Syria on June 3. Staff Sgt Caesar visits the K9 training facility to boost moral of the volunteers during the K9 upgrade project at Camp Pendleton, California on June 7. Marines assigned to Special Purpose Marine Air-Ground Task Force-Crisis Response-Africa exit an MV-22B Osprey during assault training at Sierra Del Retan, Spain on June 26. A set of MV-22B Osprey tiltrotor aircraft fly in formation above the Pacific Ocean off the coast of Sydney, Australia on June 29. Marine Corps M1A1 Abrams main battle tank with 1st Tank Battalion, Marine Air Ground Task Force-8 is seen at Marine Corps Air Ground Combat Center in California on August 5. 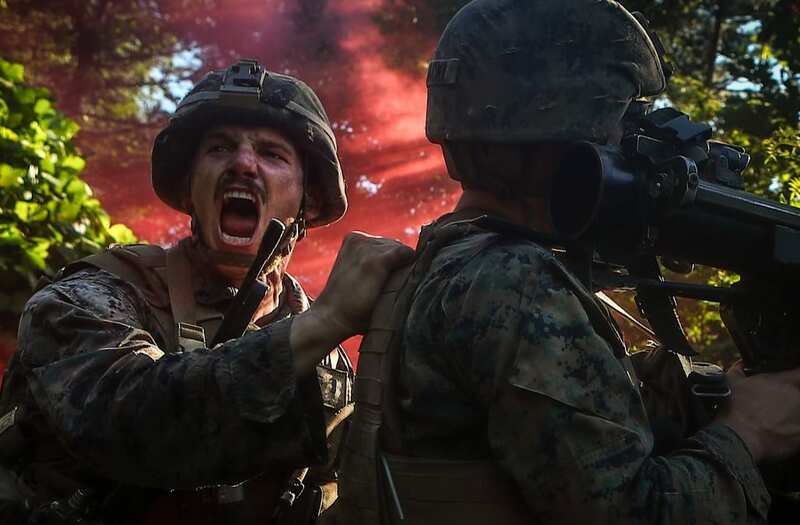 1st Lt. Harry J. D. Walker (left) communicates with his platoon while taking simulated fire during Korean Marine Exchange Program 17-14 aboard the North West Islands in South Korea on August 11. An AV-8B Harrier II assigned to Marine Attack Squadron 214, conducts a flyover above the Coeur d'Alene Airport – Pappy Boyington Field, Idaho, as part of a cross-country flight on August 12. Marines with the Maritime Raid Force, 26th Marine Expeditionary Unit, board a CH-53E Super Stallion helicopter with Marine Medium Tiltrotor Squadron 162 on August 25. The Marine Corps Silent Drill Platoon performs at the Marine Week Detroit opening ceremony on September 6. Cpl. Suzette Clemans, a military working dog handler with 1st Law Enforcement Battalion, I Marine Expeditionary Force, and Denny, her Belgian Malinois patrol explosive detection dog, prepare to search for explosives on the beach aboard Marine Corps Base Camp Pendleton, California on October 21. Lance Cpl. Luis Arana fires the Carl Gustav rocket system during live fire training at Range 7 aboard Camp Hansen on October 25. An F/A-18C Hornet assigned to Marine Fighter Attack Squadron 115 conducts aerial refueling during Integrated Training Exercise 1-18 over Marine Corps Air Ground Combat Center in California on October 28. Capt. Gregory Veteto, of Company A., 1st Battalion, 5th Marine Regiment of the 15th Marine Expeditionary Unit, punts a football sent by his wife revealing the gender of his baby during a weekly formation on November 1. LAV-25 Light Armored Vehicles from the 1st Light Armored Reconnaissance detachment fire on fixed targets as part of a combined arms engagement range during sustainment training in D'Arta Plage, Djibouti on November 9. MV-22B Ospreys with Marine Medium Tiltrotor Squadron 162, 26th Marine Expeditionary Unit, transports Marines to land from the amphibious assault ship USS Iwo Jima during an amphibious assault exercise in the Atlantic Ocean on December 7. Marines with 3rd Battalion, 4th Marine Regiment, 1st Marine Division utilize an M1A1 Abrams tank during exercise Steel Knight 18 at Marine Corps Air Ground Combat Center in California on December 10. A Marine Corps CH-53E Super Stallion assigned to Marine Heavy Helicopter Squadron 461 flies over the Rocky Mountains during a cold weather training exercise on Buckley Air Force Base, Colorado on December 13.